Istio uses the Envoy sidecar proxy to handle traffic within the service mesh. 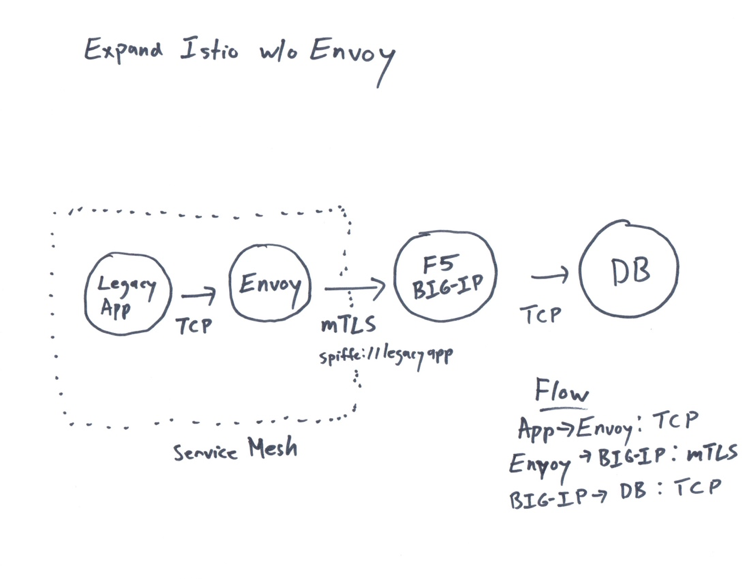 The following article describes how to use an external proxy, F5 BIG-IP, to integrate with an Istio service mesh without having to use Envoy for the external proxy. This can provide a method to extend the service mesh to services where it is not possible to deploy an Envoy proxy. This method could be used to secure a legacy database to only allow authorized connections from a legacy app that is running in Istio, but not allow any other applications to connect. A common problem that customers face when deploying a service mesh is how to restrict access to an external service to a limited set of services in the mesh. When all services can run on any nodes it is not possible to restrict access by IP address (“good container” comes from the same IP as “malicious container”). Istio cannot securely enforce that all egress traffic actually flows through the egress gateways. Istio only enables such flow through its sidecar proxies. If attackers bypass the sidecar proxy, they could directly access external services without traversing the egress gateway. 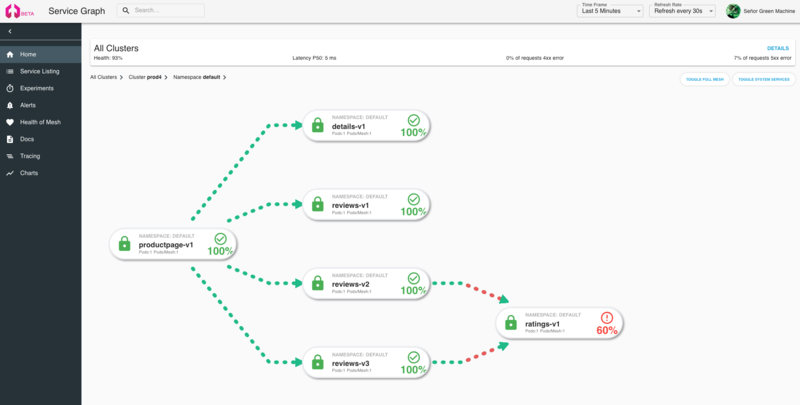 Thus, the attackers escape Istio’s control and monitoring. The cluster administrator or the cloud provider must ensure that no traffic leaves the mesh bypassing the egress gateway. Another method would be to use mesh expansion to install Envoy onto the VM that is hosting your database. In this scenario the Envoy proxy on the database server would validate requests prior to forwarding them to the database. The third method that we will cover will be to deploy a BIG-IP to act as an egress device that is external to the service mesh. This is a hybrid of mesh expansion and multicluster mesh. Under the covers Envoy is using mutual TLS to secure communication between proxies. To participate in the mesh, the proxy must use certificates that are trusted by Istio; this is how VM mesh expansion and multicluster service mesh are configured with Envoy. To use an alternate proxy we need to have the ability to use certificates that are trusted by Istio. A proof-of-concept of extending the mesh can be taken with the following example. We will create an “echo” service that is TCP based that will live outside of the service mesh. The goal will be to restrict access to only allow authorized “good containers” to connect to the “echo” service via the BIG-IP. The steps involved. First we install a set of certificates on the BIG-IP that Envoy will trust and configure the BIG-IP to only allow connections from Istio. The certs could either be pulled directly from Kubernetes (similar to setting up mesh expansion) or generated by a common CA that is trusted by Istio (similar to multicluster service mesh). Once the certs are retrieved/generated we install them onto the proxy, BIG-IP, and configure the device to only trust client side certificates that are generated by Istio. To enable a policy to validate the identity of the “good container” we will inspect the X509 Subject Alternative Name fields of the client certificate to inspect the spiffe name that contains the identity of the container. Once the external proxy is configured we can register the device using “istioctl register” (similar to mesh expansion). In the case of the “bad container” we are unable to connect. The “nc”, netcat, command is simulating a very basic TCP client. A more realistic example would be connecting to an external database that contains sensitive data. In the “good” example we are echo’ing back the capitalized input (“hi” becomes “HI”). If you want to see the process in action, check out this short video walkthrough. Let me know in the comments whether you’re interested in any of these use-cases or come-up with your own. Thank you!